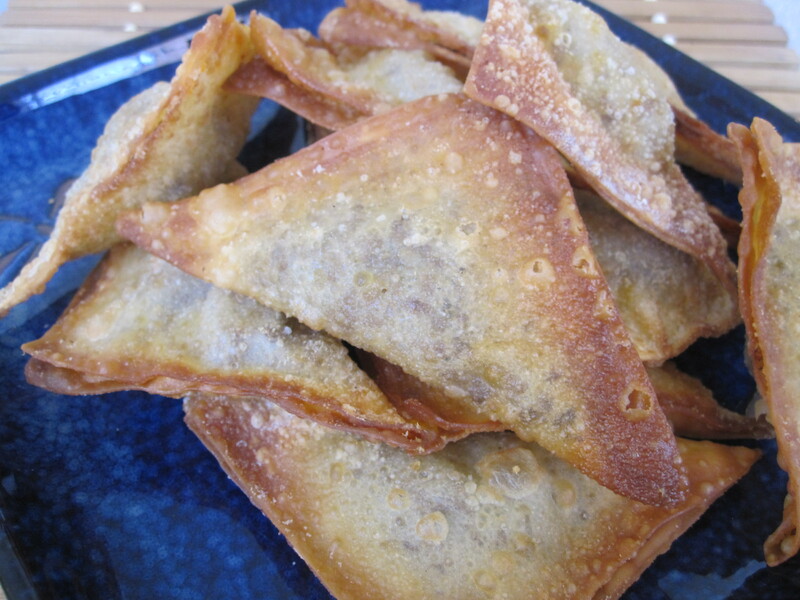 This weekend I overindulged in food, some of it was really bad for me – like the Hamburger Doritos and fried wontons. Saturday night we celebrated three of my best girlfriends’ birthdays and we ate crab and temaki sushi. I love these girls – they REALLY know how to eat. 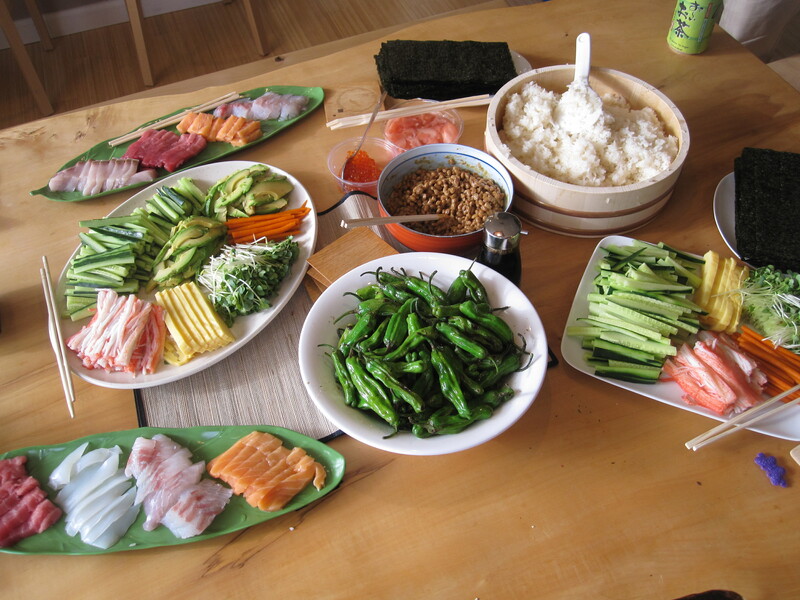 :) I forgot to take pictures of the crab but here’s our temaki spread. Sunday night we watched the Lakers game with Yin-yin and Pa-paw (Bebe E’s paternal grandparents) and they made dinner for us. We indulged on Pa-paw’s special BBQ tri-tip, Yin-yin’s super yummy cha-han (fried rice), salad AND Hamburger Doritos to snack on during the first half of Game 2 of the Lakers vs. Celtics Finals (we’ll get to the sad game at the end of this post.) Did anyone know that Doritos even makes a hamburger flavored chip? Although I haven’t had one in years, it reminded me of a McDonald’s Quarter Pounder with Cheese. It didn’t really agree with my palate, but I admit to eating several chips with Yin-yin’s delicious dip because I was s-t-a-r-v-i-n-g… and the yummy dip helped to mask the “hamburger” in the Doritos – kinda. 1) Sautee chopped onions and garlic, then make taco meat according to Lawry’s Taco seasoning packet. 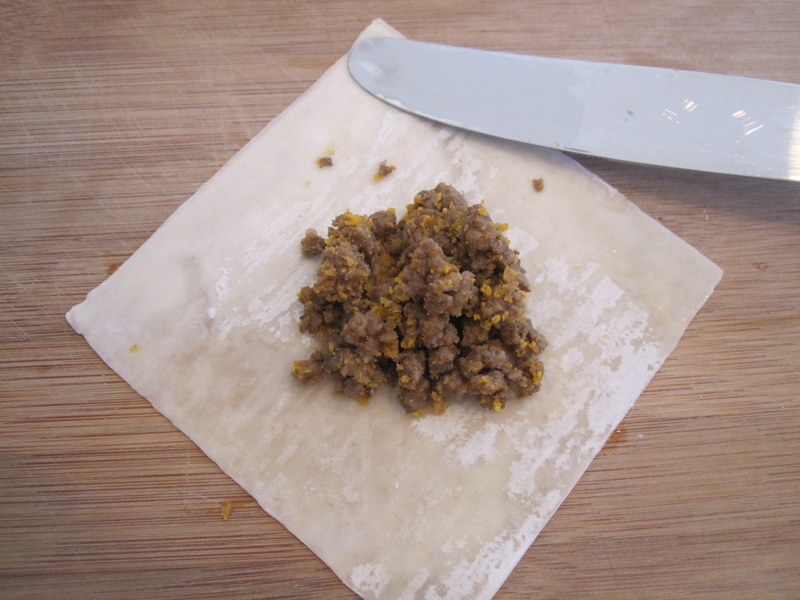 2) To make wontons, lay wrapper on your workspace and scoop about 1 teaspoon of the taco meat in the center of the wrapper. I usually work on wax paper when I make wontons and gyoza but I was lazy this day and ended-up making a mess I had to clean-up, which I regretted. 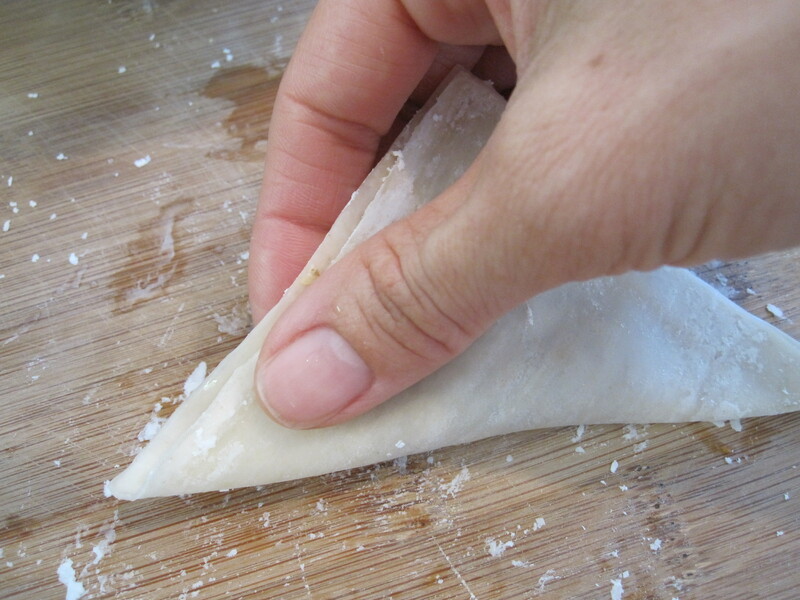 3) I use a butter knife, dip the tip in a bowl of water and run it along the 2 top edges of the wonton. Makes less of a mess. 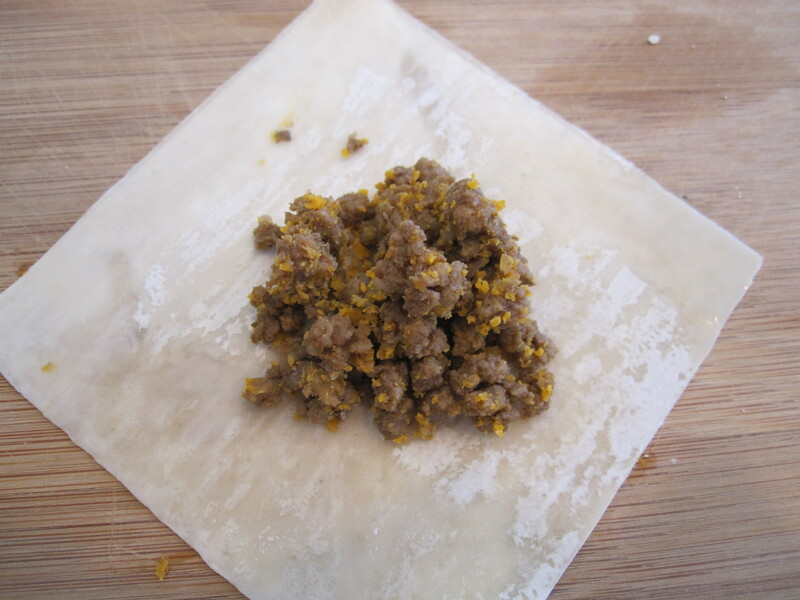 Then take the bottom and fold over the meat to seal the wonton closed. 4) Heat canola oil in a large pot until hot. I didn’t measure the temp of the oil. I just take a little corner piece of the wonton, throw it in the oil and if it sizzles and floats to the top – you’re good to go. I like to keep the range on medium-high while frying these. 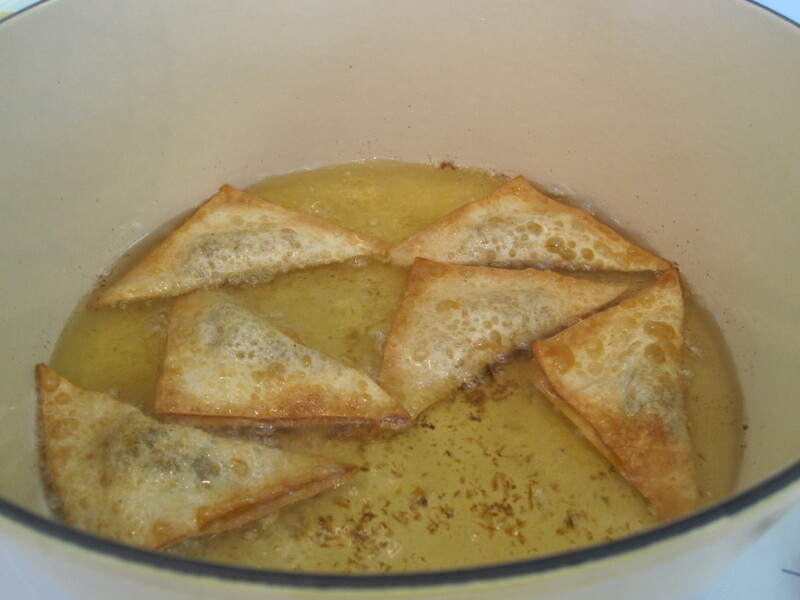 Fry the wontons for about 30 – 45 seconds on one side, flip, then let it fry another 30 – 45 seconds until golden. I let these drain on a paper towel lined plate. Serve immediately while hot. 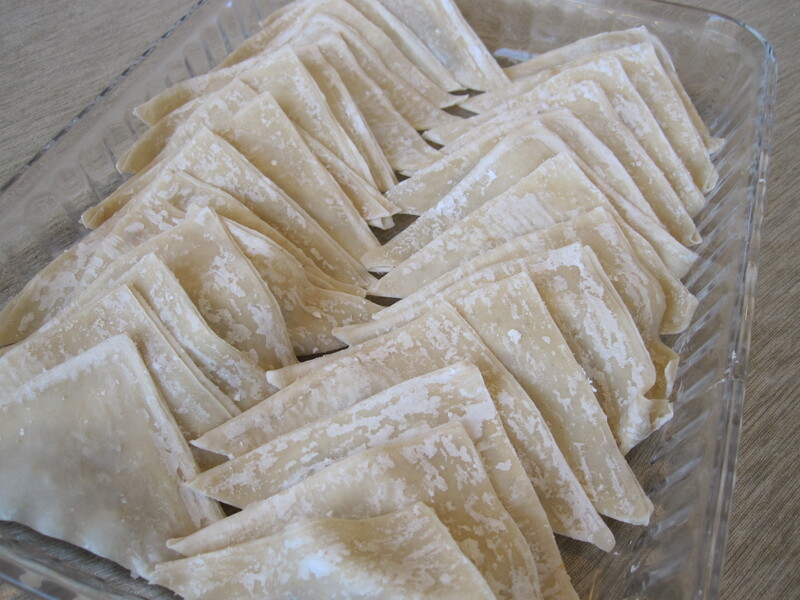 I served these with my mom’s super easy “special wonton sauce”. The sauce is basically just a mix of equal portions of ketchup and okonomi sauce and a splash of Worchestershire sauce. My mom serves this for her two types of wonton fillings and the sauce also works great with taco wontons, but you’ll probably find that the taco wontons have plenty of flavor without any sauce. Lakers, Lakers, Lakers… WHAT are you guys doing?!? 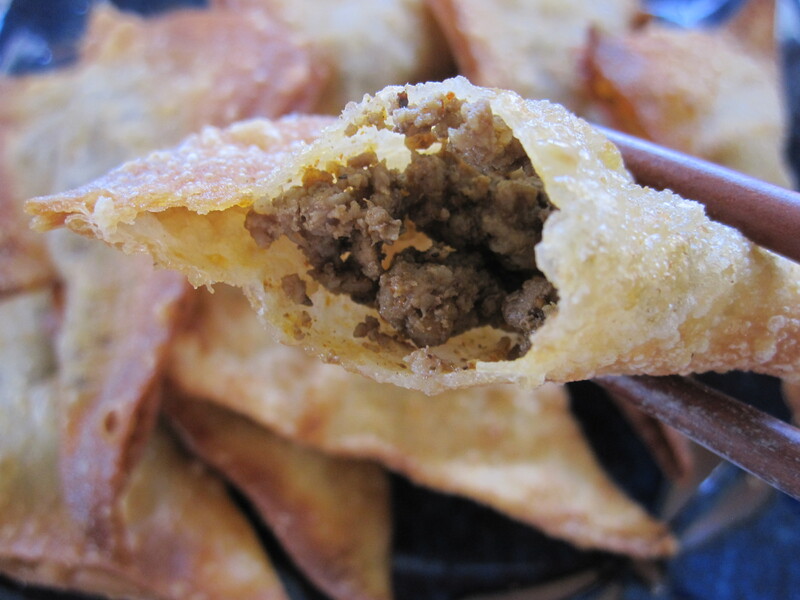 This entry was posted in Appetizers, Beef, Chinese Cuisine Favorites, Family Favorites, International, Japanese Cuisine Favorites, Lakers, Turkey and tagged ground turkey, taco seasoning, Taco wontons, wonton skins, wontons by Judy | Bebe Love Okazu. Bookmark the permalink. LET’S GO LAKERS, LET’S GO! A cheer from Winter! Didn’t seem to help tho, since the Lakers lost. Taco wontons? Now, that is one dish I really would love to try. Thank you for sharing. I hope that your Lakers team will get it together on the next game. I grew up eating my mom’s wontons too. I’ve never had a taco wonton before — sounds totally west coast. I’d love to try it next time I make wontons. thanks for posting! The taco wontons are ingenious! I would have never thought to do that. I wonder if it would work with cheese in it? Or, how about dipping the wontons in homemade nacho cheese sauce? i just had dinner but this sounds appetizing! I like your basketball updates by the way. I used to follow it a lot more–more exciting than baseball or football to me. Oooh, I like the nacho cheese sauce as a dip. That would be perfect for taco wontons! :) I also think cheese would be great in wontons. I saw a post not too long ago with a cream cheese filling although I haven’t tried it yet. Great idea for entertaining! 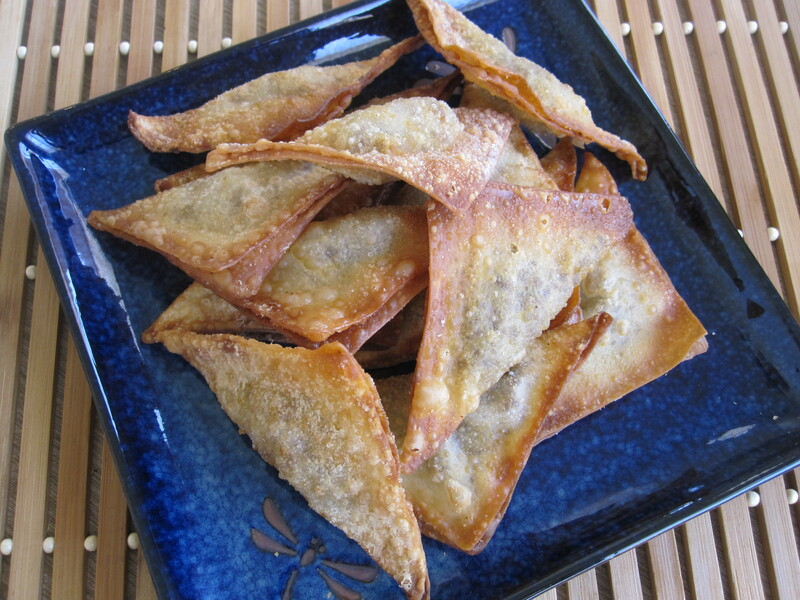 Wontons wraps are so versatile that you can stuff them with anything you like, your wontons look incredibly delicious, I rarely eat fried food, but I have to admit that I would eat those in one second! Judy these look so good! And the game last night was HORRIBLE. Love the purple pedicure! I hope that brings them the magic they need!!! Love the crispy wontons. What a great finger food Judy! THese sound good:) They remind me of taquitos or tacos dorados, which are tacos either rolled up or folded to make a pouch then fried. This is Japanese-Mexican Fusion food. Sorry, it has taken me so long to respond! There is no secret to these Won Tons really. I do add a pinch of cayenne pepper and paprika though. Also, after I brown and drain the beef, I add the taco mixture and mix it well into the meat without the water (while on the fire). Thereafter, I add the water slowly and a little at a time; it kinda makes it thicker. Sometimes I use all the water, sometimes I don’t, as it depends on how it looks. If it gets too watery, i add a little cornstarch water mixture to thicken it. Sorry, I know I sound so lame, but I don’t really measure when I cook. I go by look and taste.